A well-designed resource map can help a community take advantage of its assets. Learn how this process might apply to your own neighborhood work. August 17, 2003 | Potholes, puddles, narrow streets and drivers with one hand on their go cup." Bicycling in New Orleans can be downright intimidating! A student prepares to pedal off to class. Tulane Universitys Office of Environmental Affairs is trying to increase bike ridership in the Tulane community as a less polluting method of getting around. Equally important, bike riding is a great source of inexpensive physical activity. So how do you get more people safely on bikes, in a biking-tough city like New Orleans? Audrey Warren, a graduate student in Tulanes School of Public Health, had the idea to make a map of bicycling resources. Her theory of change was that a well-designed resource map with safety tips would decrease barriers to bike-riding. And her theory was based on a lot of good research. The more thought that goes into making a map, the less work the audience has to do to use it. She and Ms. Liz Davey, Tulanes Environmental Coordinator, brought their map idea to us at the Community Data Center. We thought this was a great use of mapping. We started by suggesting they get really clear on who their audience was and what they wanted the map to communicate. Together we determined a process for assembling all the information, and then we created the final product. They decided to design the map for all students going to school at Tulanes uptown campus. That meant that we would need to ensure that the map reflected the world as Tulane students see it, and also that it was easy to photocopy. The Bicycle Resource Map is being distributed at a number of orientation programs for new students, including Being Safe in the Big Easy, attended by almost all new freshman  so thousands of copies will need to be made. A resource map is typically designed to inform and influence behavior. The more clearly the purpose of a map is articulated, the more effective it can be. To inform students about where to find nearby bicycling resources  where to buy used and new bikes, get bikes serviced, get air for their tires, and buy accessories like helmets and lights. To provide useful tips for riding in New Orleans, and practical rationale for safety basics like wearing a helmet. It was essential to have students on the project  they are, after all, the audience for the map! Relying on their knowledge, we created a base map that covered the campus area and labeled the streets and landmarks that students refer to most. Because resource maps are only as good as the data that goes into them, Audrey looked for a reliable listing of bicycling resources around Tulane. A map is only as good as the data that goes into it . 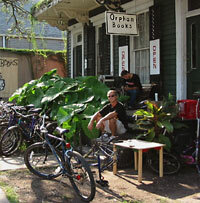 Orphan Books also sells bikes (although you wouldn't know it from just looking in the Yellow Pages). She found the online Yellow Pages at yp.bellsouth.com to be a good source for bike stores. But, no surprise, the Yellow Pages didn't provide all the information necessary. It didnt list gas stations that had air pumps, for example. And who would've thought that Orphan Books also sold bikes? Or that pawn shops can be a great place to get a good deal on a used bike? So the students on the bicycle planning team talked to area cyclists about where they go for resources and cycled around uptown to add to the data from the Yellow Pages. They gathered the information they thought a student would need to be able to use each resource (location, phone number, hours of operation, etc.). One challenge about getting such detailed, up-to-date information is that you need to have a plan for keeping it timely. The Office of Environmental Affairs committed to revising the map each year so it will continue to be a useful tool for students. New Orleans can be a really tough place to ride a bike safely, and the bicycle planning team knew they'd lose credibility if they portrayed New Orleans as a cycling utopia. The planning team wrote the text on the map to acknowledge the challenges of bike riding in New Orleans, and offer concrete tips on how to adapt to these challenges. For example, anyone who's been in uptown New Orleans for any amount of time knows that Magazine Street isn't the best place to be safely riding a bike. The narrow, curving street is lined with busy shops and on-street parallel parking. Camp Street, though, one block lakeside, is wider and residential. In the finished product, every single inch of the page is designed to serve the needs of the audience. Will the map make a difference? We put a lot of work into the map, but so what? The real question is, will it increase bicycle ridership (and especially safe bike riding)? To answer this question, the Office of Environmental Affairs has baseline data on bicycle ridership on campus and also on how many riders wear helmets (the most visible manifestation of students bicycling safely). They plan to conduct the same studies again after distributing the map to see if the map had the desired effect. If you're a New Orleans area nonprofit or community-based organization and would like to make a neighborhood resource map, the Community Data Center can help. Read the guidelines below, get your ideas for the map together, and fill out our Technical Assistance form to start the process. Resource maps like this bike map can be an efficient way to encourage people to take advantage of assets (especially under-utilized ones) that already exist in your neighborhood. Is there evidence to support your theory about what will solve the problem? Define your audience before you start working on the map. Based on your theory of change, exactly what should your map communicate? What behavior do you want the map to influence? - Find out what boundaries and features (roads, bridges, parks, etc.) are relevant to them. Put all the information in one place. - Gather data from available data sources. - Consider augmenting that data with data you collect yourself. - Make a plan for regular updates of the map. Organize the information into meaningful categories. Make the message relevant with examples your audience will relate to. Acknowledge potential barriers to using the resources. This article is a collaboration between the Greater New Orleans Community Data Center (GNOCDC) and the Tulane Office of Environmental Affairs. Denice Ross is the Information Systems Designer at GNOCDC and Allison Plyer is a Senior Consultant. Maps created by Joy Bonaguro, GNOCDC's Web and Data Production Coordinator. The Bicycle Resource Map was created as part of a partnership between Tulane University (Bike.Tulane.edu) and the New Orleans Regional Planning Commission (www.norcp.org) to develop ways of teaching bicycle safety through the large institutions (such as universities). The program is funded by the National Highway Traffic Safety Administration, which last year gave grants to five projects that would help implement the National Strategies for Advancing Bicycle Safety. Copyright © 2003 Greater New Orleans Community Data Center & Tulane's National Center for Urban Community.